Using specialised mould removing solutions may not be the cheapest or environmentally friendliest solution, or the most convenient and easily sourced like household products such as bleach, but it is definitely one of the most effective solutions. It’s my preferred choice, because they’re only designed to do one thing- kill mould. 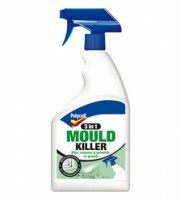 I’m going to discuss a particular anti-mould solution by Polycell, the 3 in 1 Mould Killer in this article, simply because I’ve used it successfully in the past. It’s available to purchase for approximately £5.00. However, there are dozens of other similar products available on the market. Open windows to help fumes/vapours to ventilate. Spray solution into infected area and leave for 5 – 10 mins. Wipe away with cloth, and use scrubber/toothbrush on stubborn areas. It is advised to wear the necessary protective clothing when using this product, such as safety gloves and glasses. Always keep room well ventilated when using solution. Read the instructions carefully on the bottle for a complete guide.